Inspired by the drums of the 50’s, 60’s and 70’s, our Ely Vintage Classic drums feature Mahogany drum shells made with African Mahogany as outer and inner plies, three plies of North American Poplar, and one ply of Birch. Our Vintage Mahogany shells include 10 ply Maple reinforcing rings and rounded edges. 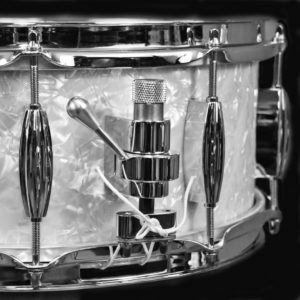 Our Vintage Classic Drums are constructed in the “Club Date” style with Beavertail lugs mounted on the center of the shells. Tom-Toms have 6 Lugs and the Floor Toms and Bass Drums have 8-Lugs. The vintage style hoops are 2.3 “Stick Saver” style. Classic Marine Oyster Pearl, Sparkle and Glass Glitter wraps are shown on our Stains & Wraps page. Other wraps can be special ordered. 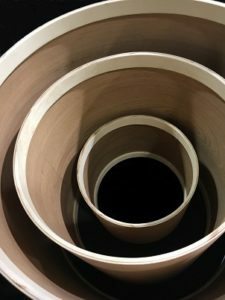 Although we will make a size drum that a customer feels strongly about, it is our belief that the sizes shown above offer and produce what we refer to as “our sound”.